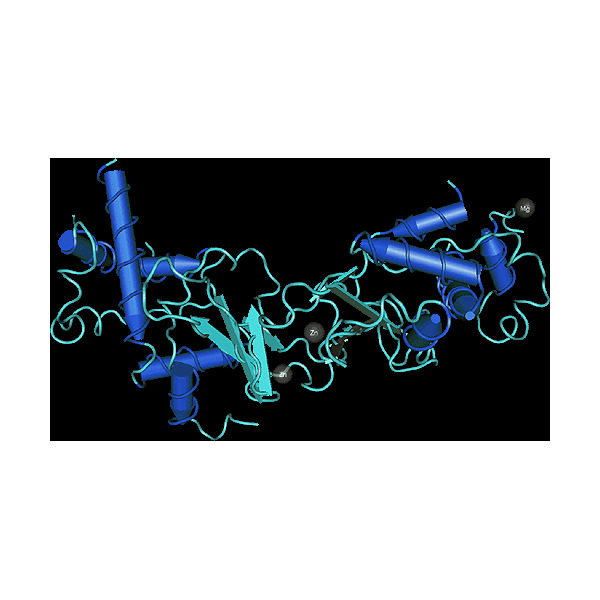 Protein kinase CK2 (Casein kinase II) is an ubiquitous and highly conserved protein serine/threonine kinase that is typically found in tetrameric complexes consisting of two catalytic (alpha and/or alpha') subunits and two regulatory beta subunits. CK2 has a number of physiological targets and participates in a complex series of cellular functions including the maintenance of cell viability. It has long been considered to play a role in cell growth and proliferation and considerable evidence suggests that it can also exert potent suppression of apoptosis in cells. In normal cells, the level of CK2 appears to be tightly regulated, and cells resist a change in their intrinsic level of CK2. However, in all the cancers that have been examined an elevation of CK2 has been observed. Recent evidence suggests that CK2 can exert an anti-apoptotic role by protecting regulatory proteins from caspase-mediated degradation. Furthermore, the anti-apoptotic function of CK2 may contribute to its ability to participate in transformation and tumorigenesis. Recombinant human casein kinase 2 beta (hCK2 beta). The beta subunbit is the non-catalytic subunit of the serine/threonine protein kinase CK2 possibly interacting with other protein kinases. The beta subunit itself does not have kinase activity, but confers stability to the CK2 alpha subunit and is involved in activity and substrate specificity. Form: 25 mM Tris-HCl, 500 mM NaCl, 1 mM DTT, 1 mM EDTA, protease inhibitor cocktail (5 tablets Roche Cat No 1 697 498 per liter) pH 8.5. Solubilize in distilled H2O or 50% glycerol.